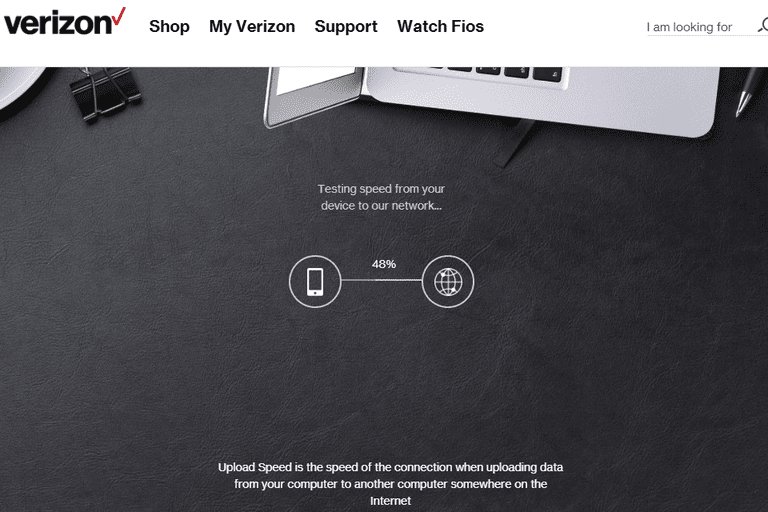 The Verizon Speed Test is the online bandwidth test that Verizon suggests their Fios high-speed customers use to test their internet speed. If you're a Verizon Fios customer, testing your bandwidth with the Verizon Speed Test is probably the best way to go if you're looking to confirm those Mbps or Gbps numbers on your monthly bill. If Verizon isn't your ISP, using this speed test probably won't be particularly valuable. More on that towards the bottom of the page, as well as some general comments on the accuracy of this test. Visit verizon.com/speedtest/. You do not have to sign in to your Verizon account, or even have one, to use this test. Click or tap Get started. Don't worry if nothing happens for a few seconds, it takes a bit to load. Wait during the Download Test and Upload Test. The whole process should take under a minute or so. To perform this test, Verizon sends and receives random data to and from your device, after which some basic math determines your internet speed in Mbps. Once the tests are complete, you'll be taken to a summary page. There you can see the final download and upload results. Record these if you're planning on regularly testing your internet speed, a good idea if you plan on asking Verizon for support or a refund based on slow speeds. The Verizon Fios speed test is really only helpful if you're a Verizon customer, and you're not looking for a "real world" test. As mentioned at the start of this article, that means the Verizon Speed Test is great for making sure that you're getting the bandwidth that you're paying for. What you may not realize, however, is that speed you pay Verizon for very likely isn't what you'll ever get when streaming from Netflix, or downloading software, etc. For a more realistic test, we recommend testing with a non-ISP-hosted, HTML5-based internet speed test like TestMy.net, SpeedOf.Me, or Bandwidth Place. If you're still not sure if the Verizon Fios Speed Test is the way to go, there are other options to test your internet speed, which has options of tests to use based on what you're looking for.